was this the real Crete? Crete is the top holiday destination for European travellers this year and Greece is the second country of choice after Spain, according to holiday bookings made through TUI, the largest leisure, travel and tourism company in the world. Three of the five most popular destinations for Germans are found in Greece: Crete, Rhodes and Kos. The other most popular holiday regions include Majorca and Antalya. Greece is also very popular among Northern Europeans. For Norwegians, Swedes, Danes and Finns, Greece is the number one holiday destination. The same is the case for Austrians, who have a particular preference for Crete and Rhodes, with both destinations ranking first and second in the Austrian top five. 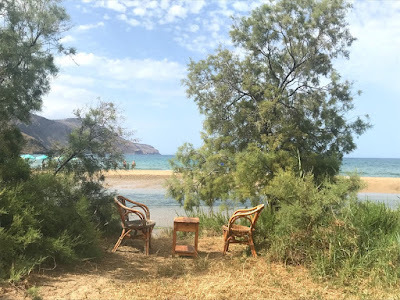 Two of us are just back in Ireland have spent two weeks in Crete, one in Platanes, on the east of Rethymnon, and the second in Georgioupoli, a resort half-way between Rethymnon and Chania. I have known Crete since 1988, when I first stayed in Rethymnon for three weeks, and have returned there constantly. But I have also travelled extensively throughout Greece over the past three decades, for work, holidays and church reasons. This was our fourth time in Greece within 12 months, but there is always something new to see and do each time. This was my first time to stay in Georgioupoli, and we decided to stay there because of a pleasant experience during a brief visit last year. But we still had some reservations, even as we arrived at our hotel. Indeed, we moved out of Georgioupoli regularly throughout that week, visiting Hora Sfakion and Frangokastello on the south coast, Chania and the only-surviving synagogue in Crete, crossing through gorges and across the White Mountains, and visiting monasteries, churches, villages and olive groves in the rural areas beside Georgioupoli. If I wanted a holiday in Brighton, or Clacton, Morecombe, Margate, or Weston-super-Mare, I could have gone to England and enjoyed evening strolls along the promenade or on the pier, or paddling up a river in small boat. 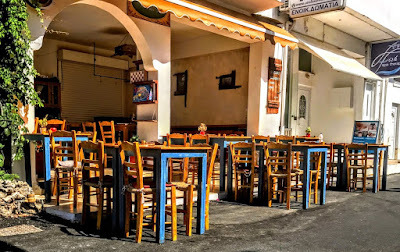 Would Georgioupoli be a resort catering only for package tourists, or could I find a flavour of the authentic Greece, the authentic Crete, without exaggerating the authenticity of my finds? On the final day, as we strolled around Georgioupoli, I realised how much we had come to like this place. For much of this second week, the thunderstorms rolled in at mid-day, the skies burst open, and heavy rains fell. 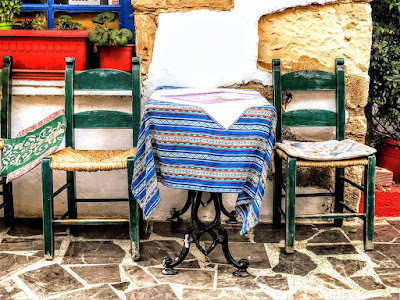 We found ourselves seeking shelter in small cafés and tavernas, enjoying the colourful gardens and the grapes and flowers hanging from balconies, and appreciating the quiet corners throughout the town. 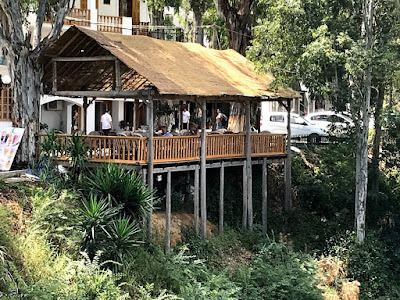 A riverside taverna had a balcony area that hangs directly over the river – like a scene from an Indian move … or perhaps even a reminder of suppers in an upper room. 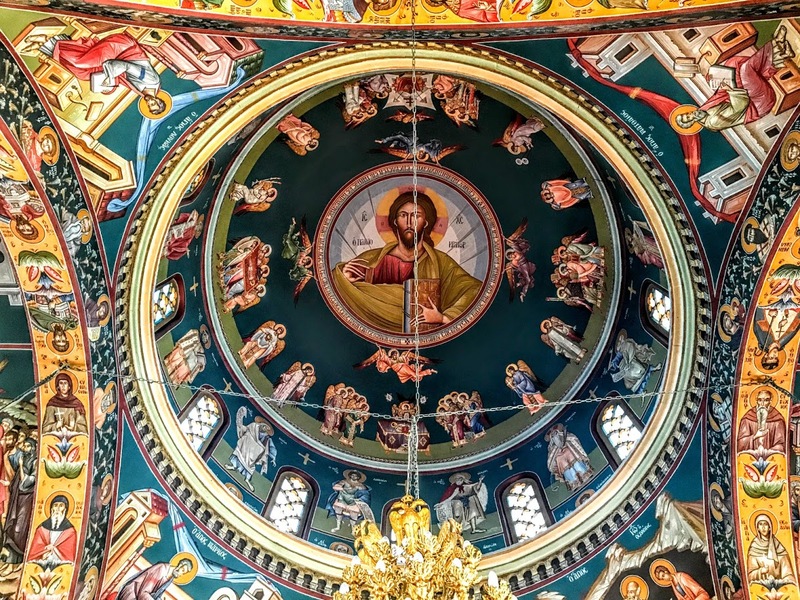 Most spectacular of all was the Church of Analipsi, the parish church with its walls covered in traditional, Byzantine-style frescoes and a dome with a majestic Pantocrator. As we said our farewells here and gave thanks for this week and for much more, I knew we had truly engaged with the spirit of Greece. I am back in the rectory in Askeaton this evening, preparing for the Diocesan Synod in Limerick tomorrow [23 June 2018] and for three service on Sunday in Castletown, Rathkeale and Askeaton, including a Baptism, the Eucharist and Choral Evensong with the choir of Saint Mary’s Cathedral, Limerick. 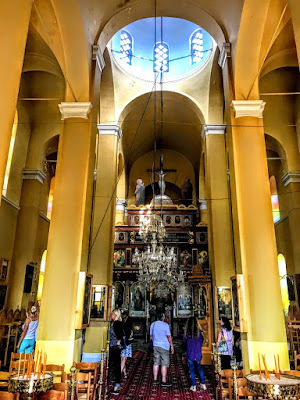 After visiting the Monastery of Aghios Georgios in Karydi on the last day of this year’s holiday in Crete, I made my way back to Georgioupoli through the villages of Kalamitsi. 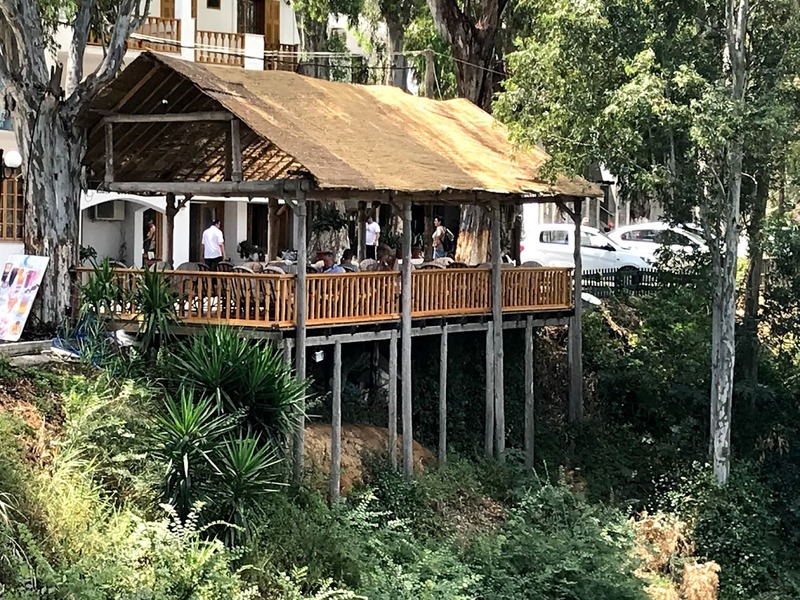 In reality, there are two villages with this name: Kalamitsi-Amigdali and Kalamitsi-Alexandrou – and they sometimes referred to as the ‘divided village.’ About 140 people live round the year in Kalamitsis Alexandrou, and about 210 in Kalamitsi Amygdali, or 350 permanent residents between the two. Where one village stops, the next village begins. On some maps they are simply called Alexandrou and Amigdali, without the name Kalamitsi, while other maps do not make a difference and simply call the both Kalamitsi. 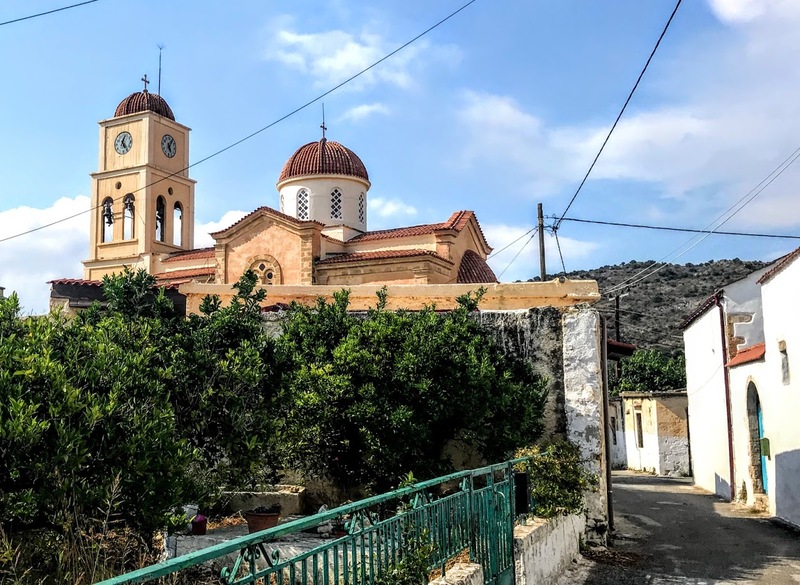 The two villages are also split between two administrations: Kalamitsi Alexandrou is in the municipality of Vamos Kalamitsi, while Kalamitsi Amygdali is in the municipality of Giorgioupolis. 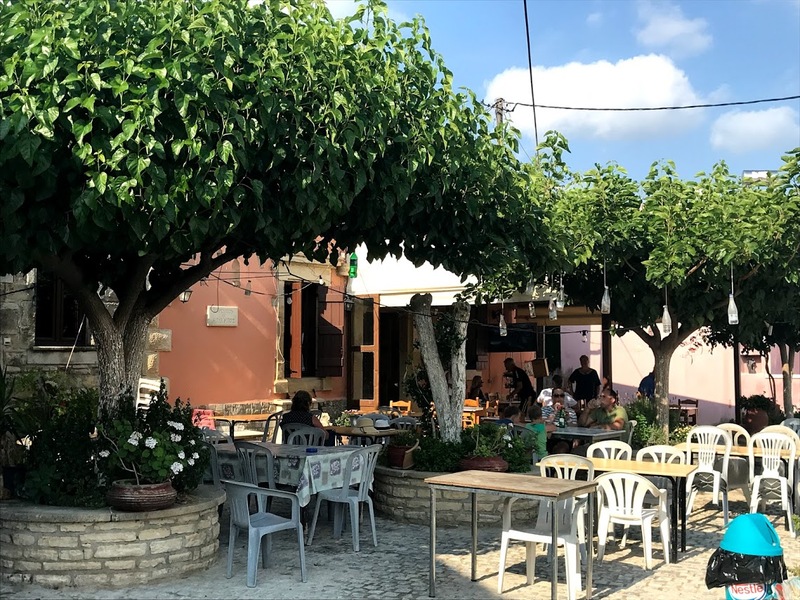 These villages lie in the beautiful green Apokoronas area between Souda Bay and Rethymnon, about 8 km from Vamos and five minutes away from Vrysses, with a drive of less than 15 minutes to Georgioupoli on the coast. Both Kalamitsi villages are peaceful, traditional, and offer beautiful views of the Lefka Ori or White Mountains. Between them there are two tavernas, a kafenion and a mini-market. Kalamitsi Alexandrou also has an impressive underground reservoir, Softas, constructed during the Turkish occupation of Crete. 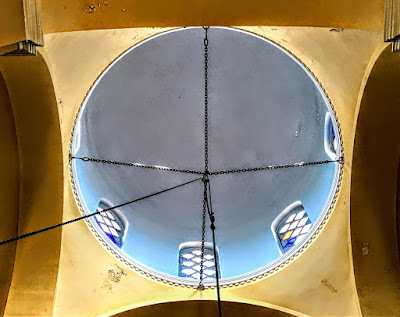 But the main purpose of my visit was to see the large, modern, cross-shaped Church of Aghia Triada or the Holy Trinity, behind the narrow streets in Kalamitsi Alexandrou. Although it is not in the centre of the village, the church is impossible not to find at the end of the narrow streets. With its large narthex, and tall dome and belltowers, it can be seen for long distances across the surrounding countryside. But the church has many other usual features too. 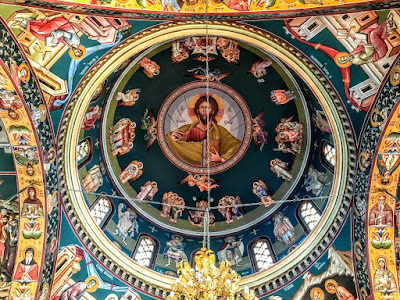 Unlike many churches in Greece of this shape, the dome remains undecorated, without any Pantocrator and the usual supporting frescoes. Indeed, the walls and pillars of the church are largely undecorated too, without frescoes, and the old icons preserved in the church, many predating its building in the last century, are in wooden frames that are seldom seen in Greek churches. These framed icons include, naturally, an icon of the Holy Trinity, and an icon of the Virgin Mary said to have been found in the foundations of an earlier church when the present church was being built. The central door of the iconostasis has an interesting image portraying Christ present in the Eucharist, with a symbol of the Holy Trinity above. 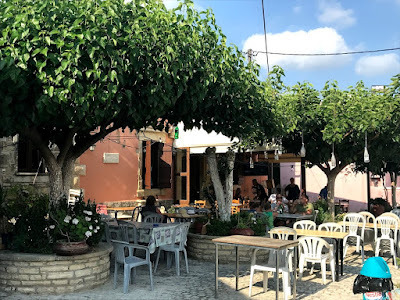 After visiting the church, we returned to the square in Kalamitsis Alexandrou and enjoyed Greek coffees at the Kafenion Kolymbos before returning to Georgioupoli for the last hours of the holiday.